I have been transported around the world and to my pilgrim personna. In other words I’m on the Camino in Spain again. Taking just 31 days and planning to walk from Seville to Salamanca or Zamora (500-600 km). My first flight saw me feeling a bit anxious and guilty – Why am I doing this? Shouldn’t I be “helping” my family in some way by staying home and doing something or other? By my second flight I had exchanged a couple of messages to wrap up loose ends at home (well they were loose in my mind) and I had successfully overcome the trepidation. Walking off the plane in Madrid and finding my way to the Atocha station, my boots and backpack felt perfect. Two and a half hours on a high speed train took me to Seville. Seville is a busy city on a spring weekend and there is a lot to see. However, I think I’ll just start walking north tomorrow, and leave the sightseeing to another trip. 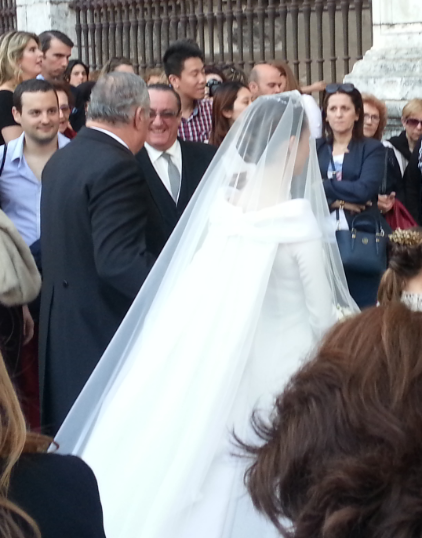 There was a wedding at the cathedral last night. Guests were easy to identify in the crowd of locals and tourists who wandered about. They were sleek and stylish (men in formal tails; women in simple but impossibly elegant dresses) in a way that Spaniards are supreme. My dinner was a little steak and fries, dripping in delicious olive oil, with a tasty but visually unappealing mush of spinach and garbanzo. A glass of vino tinto of course. Good to be back to high calorie tapas that require a long walk the next day. Remember that way back after dinner! Tiny room with sink but shared bath and toilet. €25. March 18, 2017 in Camino 2017 - Via de la Plata, Camino de Santiago. I am sure I will eventually be able to find the muffin tin without you here. In fact today I found the popcorn popper without asking you! Yes, the Camino keeps calling, doesn’t it? “Impossibly elegant”? Don’t despair so easily!